Junior Step Fundamental Course provides a fun and stimulating environment in which your child can enjoy making music on a keyboard. It is open to children aged between six and seven years old. In Junior Step Fundamental we believe that fun approach to learning music is important. We achieve this through listening, singing, playing and reading activities. Course material consists of a series of themed text books with a visually striking cartoon style presentation designed to appeal to children of this age. An examination syllabus is available for the course fully accredited by Trinity College of London meaning that skills learnt can lead to your child achieving academic qualifications via the National Qualifications Framework. 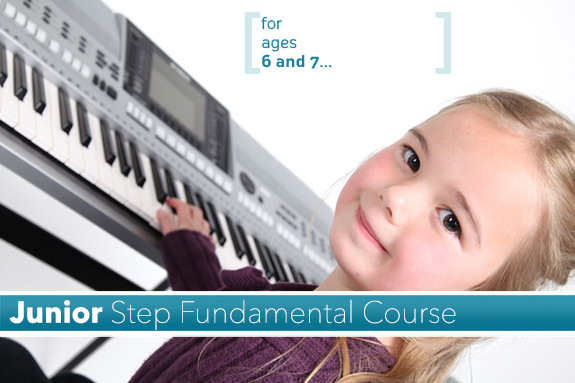 In Junior Step Fundamental your child will get a thorough understanding of music and keyboard fundamentals. Having completed the course they will be able to operate a keyboard with confidence and with a good technique. They will have learnt to play by ear and read from traditional notation. As well as solo playing your child will learn to accompany other musicians as well as valuable improvisation skills. Finally your child will take their first steps in the arts of arranging and composing and even learn to record their creations on their instrument. In the early stages of the course, parents are encouraged to participate in the lesson, although after the first six months most children prefer to go it alone. We place a great emphasis in Junior Play for Keeps in not just playing the notes but expressing the mood and the feeling of the music. Strong and vivid images, storytelling and practical demonstrations from the teacher produce a far more musical performance from the child than can be achieved through a strict notation led system. Book a free taster lesson on Junior Play for Keeps in order to experience this fantastic course for yourself.